Oldie but goodie day at Catch The Bug. What this means is we pick an older image from The Bug-A-Boo Stamps Store and play with it. Why? Well, maybe because some people have never seen it! I am using Rock Star boy, I love this image, perfect for that younger boy in your life. I colored with copics and the paper is from Echo Park. The inside says "Hope Your Birthday Rocks"
What a cute little rock star! Just adorable for our birthday challenge. Thanks for playing along with us at Cards in Envy. 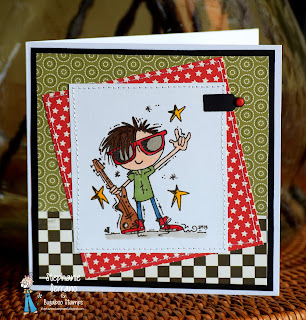 That is a really cool birthday card for a young teen guy; and I love your paper choices! Thanks for joining in the fun at Cards In Envy Challenge! Stephanie, this is just adorable.